On October 3, 2016 the New York City Energy Conservation Code was updated with its strictest requirements yet, making it more rigorous and reflective of a state, national and international push to drastically reduce greenhouse gas emissions within the next 33 years. This made New York just sixth in the country of states implementing steps towards reaching 80 by 50, a climate target set by the EU and G8 nations in July 2009 to reduce greenhouse gas emissions by 80% by 2050. The updates also make New York City compliant with the most up-to-date federally certified commercial and residential energy requirements as developed by the Department of Energy (DOE). The new energy code takes its cue from Passive House standards by calling for much higher insulation values, air tightness testing and verification, and closer attention to mechanical penetrations in the envelope. The Passive House standard itself is the linchpin to meeting NYC’s 80 by 50 goals as ‘virtually no other standard delivers buildings that meet this goal.’1 And beyond 80 by 50, New York City standards are undoubtedly on a path towards making Passive House a requirement in the future, despite allusions by President Trump towards undoing the climate agreements the US has committed to. So what is a Passive House anyway? A Passive House is neither passive, nor necessarily a house. It is a super-insulated, airtight building of any stature whose envelope acts as a thermos, regulating the indoor temperature and minimizing the need for mechanical heating and cooling. A Passive House building reduces heating and cooling energy needs by 70-90% while providing a high level of comfort and increased indoor air quality for inhabitants. Passive House is both a set of design principles and a standard for energy efficient buildings. Key aspects of passive design are continuous insulation, air-tight construction, optimized window performance and solar gain, thermal bridge-free construction, and minimized mechanical systems with balanced heat and moisture recovery ventilation. It was created in response to the 1970s energy crisis in the United States, gained traction in Germany and as a result is widely believed to have originated there. In the past few years, however, it has received ongoing recognition and become more of a common phrase back in the States as cities nationwide turn to it as a realistic path to dramatic reductions in energy use. During the 1990s, Europeans further developed the application of passive principles. Scientists Dr. Wolfgang Feist and Dr. Bo Adamson advanced the design techniques and created the passivhaus performance metric. Not much later the first passivhaus was built in Darmstadt, Germany and in 1996 Passivhaus Institut (PHI) was founded. This inspired an Illinois architect, Katrin Klingenberg, to redefine and upgrade the standard and create the Passive House Institute of the US (PHIUS) in 2002. Both programs are performance based and concentrate on reducing energy, however, a key difference is that here in the States the PHIUS criteria take climate zone variables into consideration. The climate-specific standard takes into account the vast differences in the environments of North America, while in the European standard there is no variation in metrics based on location or climate. Looking at Passive House in relation to other green building programs such as LEED, NYSERDA and Green Communities, PHIUS encourages designers to pursue the standard regardless if they intend to certify the building or not. Which means that even if a project cannot make it to certification, it is acknowledged and listed as “Passive House Designed.” This is a new idea among green building programs, none of which reward determination. If a project does not hit a certain number of points or cost savings, it does not receive certification and is not acknowledged whatsoever. However, a project that pursues PH but does not cross the finish line will still receive recognition and praise for its labors. Passive House’s potential impact on reducing greenhouse emissions from the building sector, its emphasis on lowering energy consumption and elevating human comfort through a non-prescriptive approach, and its recognition of intent make it a force in policy making to be reckoned with. By now the term Passive House has gained enough attention that people are starting to take notice, even when most buildings built to Passive House standards may not be particularly noticeable as such. That’s the beauty of Passive House, we can build and renovate to suite the variety of tastes and building types, but function with minimal to zero energy, or perhaps even produce energy. As a standard, Passive House is democratic, accessible and perhaps the most socially responsible one currently in use. Why? Because you don’t have to seek certification to be recognized. You don’t even need to seek recognition to know you made the right choices, your energy bill will remind you every month. Now that we are at the floodgates of a passive revolution, this is a good time to take a critical look at the materials used in achieving Passive House goals in terms of health and, once again, energy. Energy is, after all, needed in the entire lifecycle of any and every product, in everything we build. This embodied energy includes research, design, production, delivery, installation, maintenance and disposal, and this lifecycle affects the health of inhabitants as well as every person and every part of the environment touched along the way. As consumers we have choices, even when it comes to erecting a structure built to stringent energy use standards. As architects we have a responsibility to advise on best practices, including material choices. For example, should we create Twinkies by wrapping our buildings in a cheaper product, manufactured with toxic substances that are actually banned in much of the world and whose longevity is called into question? Or should we invest in our environments, inside and out, by using a more expensive product made with recycled content, without harmful agents, that naturally protects against both fire and all known pests? The comparison here is between extruded polystyrene (XPS) and cellular glass insulation. They can both be used to meet insulation standards for a passive building and are both readily available on the U.S. market. Yes, XPS is cheaper, yes, it provides better insulation value per inch, but its manufacture produces many times more carbon in terms of embodied energy than cellular glass and one of the chemicals it is made with is 1,430 times more potent a greenhouse gas than carbon dioxide. Carbon footprint aside, using XPS is like wrapping the places we spend most of our time in, in Saran wrap. Should our built legacy be a world full of shrink-wrapped buildings that yes, were built to Passive House standards but at the ecological expense of others? When we chose XPS, how long do we really need before our buildings become carbon neutral? To help consumers begin to think about and select building components in healthier terms, OCV has compiled a chart of materials and their insulation properties. This is just one aspect but it’s an important start to thinking about building components in terms of human and environmental health. OCV Architects’ first Passive House project, Our Lady of Lourdes Apartments, is a mixed-use, multi-family redevelopment in the Bushwick section of Brooklyn. The three buildings combine rehabilitation and adaptive reuse of the Our Lady of Lourdes Convent with two new buildings, eight and six stories, to bring 100,000 square feet of affordable housing and community spaces to the area. Sustainable features include roof top photovoltaic panel system, energy efficient lighting, fixtures and appliances. On-site amenities include laundry facilities, rooftop and rear yard green spaces as well as recreation spaces for residents. One of the key principles in Passive House design is the reducion of heating and cooling loads through openings. 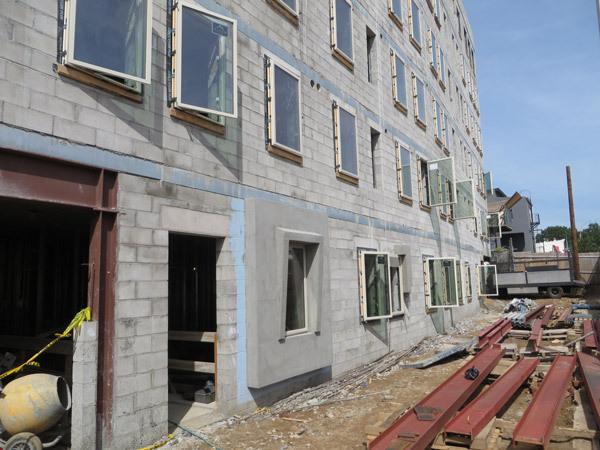 At Our Lady of Lourdes Apartments, triple-pane window glazing and 7″ insulation (image below) minimize heat losses and gains while a 7″ overhang on south and west facing windows acts as a built-in external shade to further reduce direct summer sun heat gains. The project is being developed by Ridgewood Bushwick Senior Citizens Council and Georgica Green Ventures and is expected to reach completion at the end of 2017.